The same vibe, but for Christmas. I pulled this table together for a last minute supper with friends one night over the holidays. 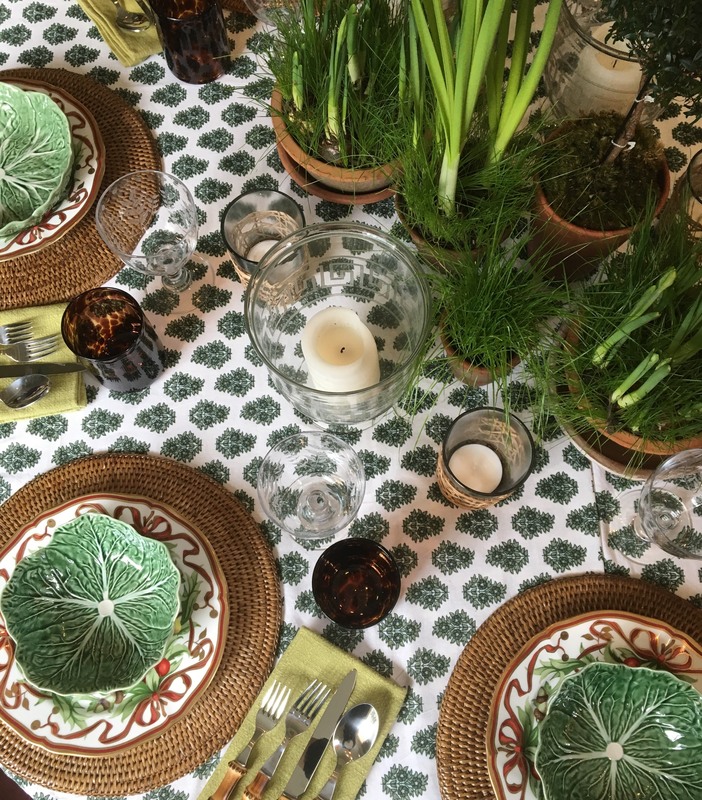 Having the block print tablecloths (and/or printed napkins) on hand makes it all super simple. It's a foolproof go-to. I am not sure when I actually fell in love with block prints but . . . when I fell, I fell pretty hard. Since that time, I've spent a lifetime collecting them. I kind of feel like the block print is a bit harder sell here in the States than it is in Great Britain. Certainly, with English Imperialism, Indian culture so permeates the English that I ask myself exactly where one ends and where the other begins. Who has an English friend who doesn't love a curry or have a least one paisley block print in the mix of their house? And, if you look back through the classics of the old English and French fabric houses, such as Colefax and Fowler and Le Manach, you can find plethora and extraordinary examples of Indian influence. I won't bore you with those here today but I do draw great comfort in that long and stately provenance in busting out my block print table linens. Not only because of that provenance, but also because Indian block print linens always hit perfect pitch. They go indoors and outdoors. They go high; they go low. My jam is to use them with rattan and a very understated center, including house plants potted in terra cotta, ivy in baskets, myrtle topiaries or, honestly, whatever I have around my house at the very moment that I am putting the table together. I love adding hurricanes wrapped in rattan, wicker or rattan placements, and my bamboo flatware. 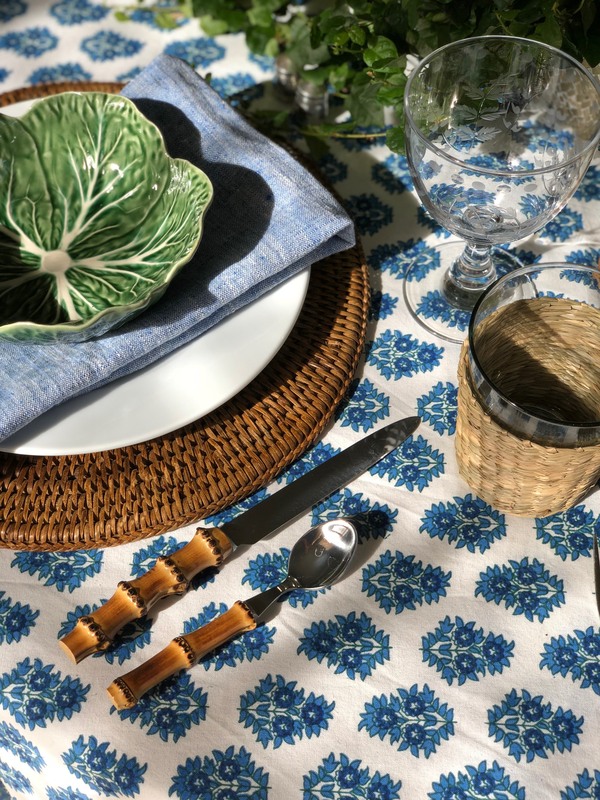 If you are looking for your block print jam, try Pottery Barn's super fab block print tablecloth and napkin options (on sale!) or Roberta Roller Rabbit tablecloth and napkins like these or these. Also worth checking out: these and these by Madeline Weinrib (pretty dope). For the OG, check out Les Indiennes Sophie tablecloth and both the Helene and the Jacqueline napkins. Serena & Lilly has great woven placemats and chargers like these, these, and these. While you are there, check out the rattan hurricanes. Pottery Barn also some has some good basics like rattan chargers and jute placements. My absolute favorite for the outdoor table, however, is Amanda Lindroth, hands down. You will find her sales staff to be most polite and attentive. They can pull together everything you need and ship it out on the double. You can order online but don't be afraid to pick up the phone and call 561 249 1205 or email orders@amandalindroth.com.